W1 - Small wood core. Cartwheel wrapped with American felt. Very articulate and clear stick. Lots of attack and these meant to move quickly. W2 - Slightly larger core than the W1. Cartwheel wrapped with German felt. Excellent all-purpose mallet and can cover lots of repertoire. W3- Noticeably larger than the W2. Cartwheel wrapped with lots of German felt. Good for large single notes and occasional rolls. The Badass - Born on Feb.10, 2010. Medium-large cork core. Wrapped with a dense German felt. This mallet covers a lot of ground. Full sound and very versatile. The Badass. Co-conceiver of this gem is Edward Stephan. The Leonard - Large cork core. Wrapped with American felt soft side out. This a very articulate mallet, but not harsh. Despite the large size it moves well and despite the cork core it produces a lot of sound. LBB - Large cork core. Same size as The Leonard however these are ball wrapped with a large amount of soft German felt. Excellent for extended loud rolls and great for single notes throughout range of the timpani. Merlin's Wand - synthetic cork combination. Not really sure what it's made of, to be honest. If The Badass and The Leonard had a baby, it would be this mallet. A bit heavier than both, but slightly smaller than The Badass. Wrapped with American felt soft side out. Fzero microfiber- Smallest of the felt cores and wrapped with an extremely durable microfiber suede. Super articulate and pointed sound. F1 - This is a felt version of the W1. Hard American felt. Same characteristics as the W1 but more forgiving on louder dynamics. F2 - "2's" on all cores generally well-rounded sticks because they're not too hard or soft or big or small. The F2 is no exception. The difference with this "2" is that they're wrapped with American felt soft side out. So while it's not ideal for exposed rolls, you can do pretty much anything else with them. F3 - A solid medium-large mallet. Bigger than the F2, but not as big as the F4. German felt wrapping. F4 - Largest of the felt group and wrapped with German felt. Produces a full and rounded sound. These are the most top-heavy of the bunch for they're ideal for fortissimo decrescendo rolls and large single notes. Deercow - An L1 core wrapped with deer suede. I was never happy with my chamois mallets that I had purchased over the years. Always to brittle and too much "tick". So I wrapped some deer around some leather(cow) and thought the end result was much better. L1 - very close in size to the W1 and F1. Wrapped the same way with American Hard felt. 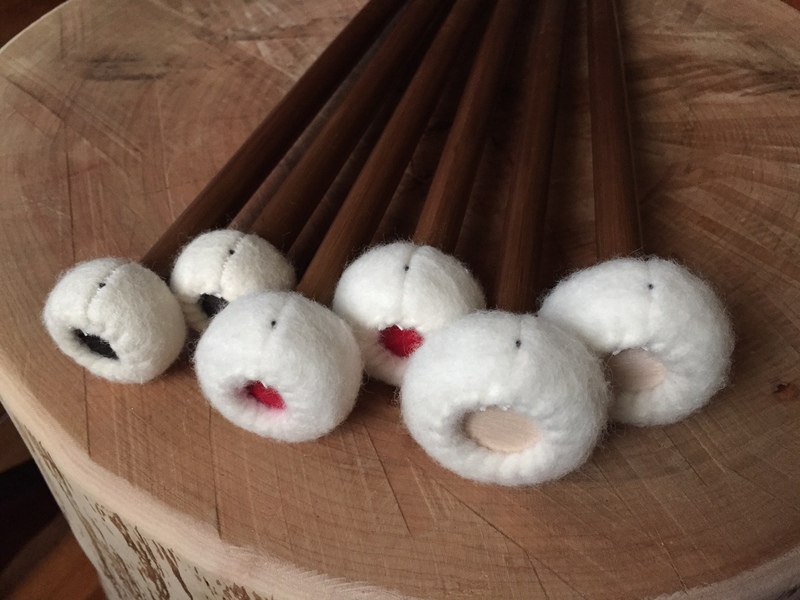 The leather gives the mallets a darker, bigger, and broader tone. The should be called "Fat W1's". L2 - same size core as the L1, but wrapped as a ball stick with soft German felt. More versatile than the L1 and a great general use stick. AKA "Fat W2's". L3 - larger and thinner than the L1/L2's. Basically these are "Fat W3's". CR1 - Same size as the W1, but not as harsh in attack. The cores for this series are made up of bits of cork and bits of neoprene mashed together into one solid piece. Lots of life off of the drums and the tone broadens as the volume increase. Subtle differences, but noticeable in feel and tone. CR2 - Same size as the W2. Wrapped with soft German felt. Cartwheel or ball wrap. Please specify if you have a preference. Cartwheel is the default.